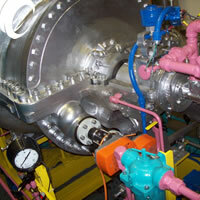 Turbine capacity control is afforded through the use of an inlet control governor valve. This valve simply opens or closes in response to demand from some upstream control or manual device signal. Such approach for the purposes of turndown alone is perfectly acceptable. However without consideration to chest pressure, a great deal of opportunity to the overall available energy savings remains unchallenged. As governor control valves close, downstream chest pressures and the ultimate nozzle striking velocities "fall off", therefore requiring a greater respective steam volume at this reduced pressure for an otherwise relative unit of work. Essentially, the steam volume required for a given work unit increases as velocities decrease. This circumstance to part-load is well recognized by the turbine appliance manufacturer and as a result turbines are factory fit with a means of manually controlling the nozzles by closing or blocking them off. 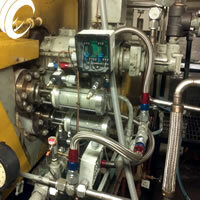 This results in an increase to the pressure introduced to the now more efficient remaining nozzles. A very favorable correction affording high striking velocity and low steam volume. 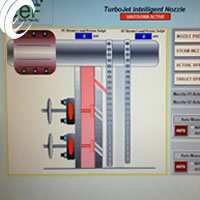 TurboJett Intelligent Nozzle Optimization, using the favorable benefit of high striking velocities to energy savings manages the turbine chest pressure within the PLC logic at a polling rate of seconds. As chest pressures are reduced (as programmed by TJETT front panel setpoints), the logic recognizes both an unecessary need for a full nozzle ring and the inefficient high volume requirements. When conditions are recognized stable (time) and not in a transient mode a digital output to function one of several sequenced Electronically Actuated nozzle control valves occurs. This continues throughout the valve scheme. Should a demand represent, the processor requires both a period of time and dead band of drift from target RPM before committing to opening any of the valves. These points are presented in setpoints accordingly.